By the time March rolls around, Salt Lake City residents are ready for spring. And while it may still look very much like winter, temperatures are slowly warming and the snow is receding. This segue between winter and spring in the high-mountains makes it a perfect time to visit for those who want to both recreate and take part in the city's cultural events. 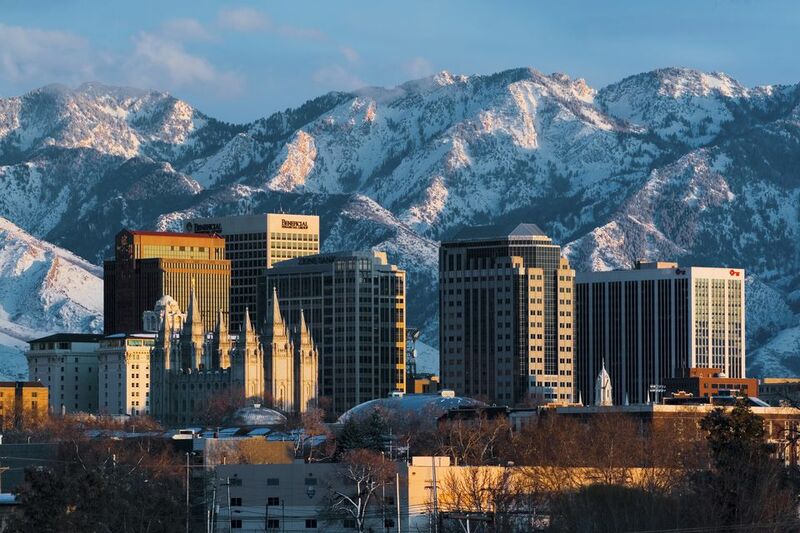 Catch a concert at the Depot, attend a Utah Jazz basketball game, or join spring breakers on the slopes to round out your stay in this magical location. With snow still prevalent in the mountains and a plethora of world-class resorts surrounding it, Salt Lake—hands down—is one of the best spring skiing destinations in the country. Reasonable airline rates help you access Park City Mountain, Snowbird, Solitude Mountain Resort, Deer Valley, and Alta Ski Area (no snowboarders allowed at the latter two). Expect a spring storm in March, complete with awesome powder conditions. But, don't forget your sunblock. The Depot, Salt Lake's premier four-story music venue, lives in the historic Union Pacific building at the Gateway Mall in downtown. And it's a must-visit location for anyone wanting to catch a national touring act. Frequented by some of the biggest names in popular music—like Dua Lipa, Brockhampton, and Cody Jinks—the Depot will keep you rocking until the wee hours. The national act, Disney On Ice, usually makes a showing in Salt Lake each March. So, if you're traveling with young children, this is a great event to put on your list. Kids (and adults alike) will enjoy the magic of their favorite Disney characters as they're brought to life in this annual production on ice. Book in advance to ensure your seat. For hockey fans, no trip is complete without catching a Grizzly hockey game. And this NHL feeder team will be sure to put on a good show. With several home games each year, you can rub shoulders with the locals while catching some first-rate ice time. Check the team's website and purchase your tickets for a Maverick Center game. For those who like to eat local, the absence of a winter farmer's market is a sad sight to see. But that's not the case in Salt Lake where, for the past several years, the winter market has graced the downtown scene each Saturday. Hosted in the historic Rio Grande Depot building November through April, this market features greenhouse-grown produce, local meat, fresh dairy products, and seasonal offerings. Nothing is more special than seeing a real Broadway show at the beautiful Eccles Theater. This intimate theater hosts several touring Broadway productions each year, with every one being just as magnificent as if you attended the showing in New York. Make sure to book ahead of time for national performances of Wicked, School of Rock, and RENT (to name a few), because seats sell out fast. The Pioneer Theatre originally opened on 1962 as the official "State Theatre of Utah," and continues to present a fantastic showcase of performances every month of the year. A true theatre-in-residence at the University of Utah, you can catch a host of performances, including large-scale musicals, contemporary dramas, and comedies. Abravanel Hall welcomes the Utah Symphony to the stage several times each March and the lineup usually includes the Zions Bank "Films in Concert" series, featuring movie classics performed in typical symphony fashion. Productions also include partner performances with the Utah Ballet and other showings at the Val A. Browning Center venue in Ogden. Wiseguys Comedy clubs in downtown Salt Lake, historic Ogden center, and West Jordan bring live comedy shows to Utah audiences almost every night of the week. Catch open mic night on Wednesdays to see the best of Utah's amateur and professional comedians perform. This 21-and-over club makes for a great adult night out, complete with club-style seating and a cafe. The Utah Opera graces the stage at the Janet Quinney Lawson Capitol Theatre in Salt Lake City. Committed to the contemporary vitality of opera, this company produces non-traditional performances that broaden the demographic of traditional opera spectators. And for audience comprehension, this young theater implements supertitles—the English translation of the sung language projected above the stage. So, there's no excuse not to attend this fine art production.